Those of you that follow me on Facebook know that ADD Daddy recently came down with the dreaded Man Cold. Since he was nice enough to share said cold with me, it brought to light the subtle differences in our behaviors/responsibilities when we are sick. You see, when I get sick, I still have to cook, clean and mom likes it's nobody's business. When my husband gets sick, however, he does nothing of the sort. Like most men, my husband is a gigantic baby when he is sick. Unlike most men, however, he doesn't stick around to annoy me with his constant whining and sniffling. No, he bails on me completely. When ADD Daddy gets sick, he goes into hibernation like a bear, only to return when he is completely healed. I, on the other hand, am stuck in the trenches with two tiny soldiers who have constant needs. To illustrate how our sicknesses compare, I have made this handy graph. FANCY! 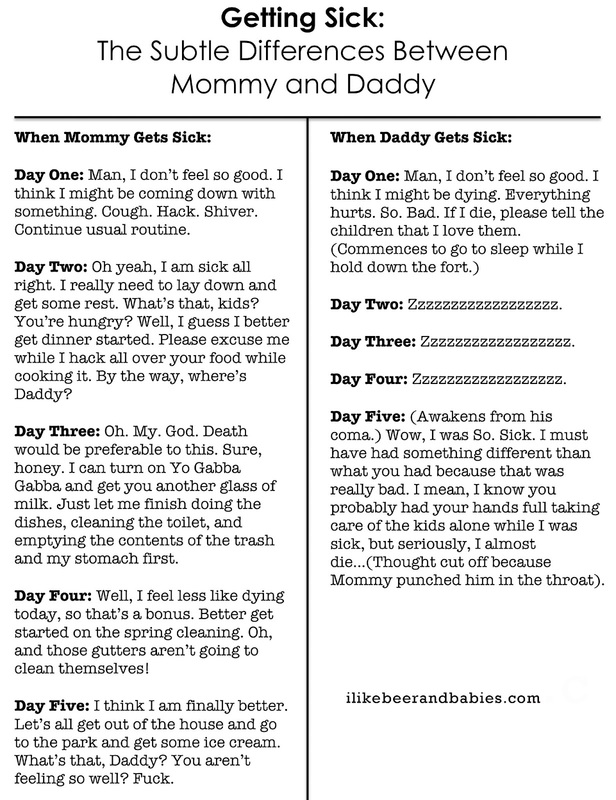 So what's it like in your house when you/the hubs gets sick? Is he there to wait on you hand and foot or are you stuck working while suffering the effects of hand, foot and mouth?